Red Bull Soldiers past and present. The 100th Infantry Battalion (Nisei)(Separate), which was assigned in place of the 2nd Battalion, 133rd Infantry, from September 1943 through May 1944, and the 442nd Infantry Regiment (Nisei) which was attached to our Division from June 1944 through August 1944, have an especially honored place in our memories and history. We are pleased and likewise honored that many of their veterans have come to look upon the "Red Bull" as their 'home' division. The 1st Ranger Battalion, though not a part of the 34th Inf Div, was activated in 1942 with 80% of its personnel coming from this Division. Please be aware, that unit attachments were often for periods of days or weeks, but generally not for an entire campaign. The Distinctive Unit Insignia (DUI) collection below represents the major units of the Division during World War II. Smaller units, such as Band, HQ, MP, Ord, QM, Recon, and Signal did not have their own DUI, but wore that of the Division. The DUI shown for the 109th Medical Battalion is the one currently authorized. We have not been able to get a good image of the WW II design. 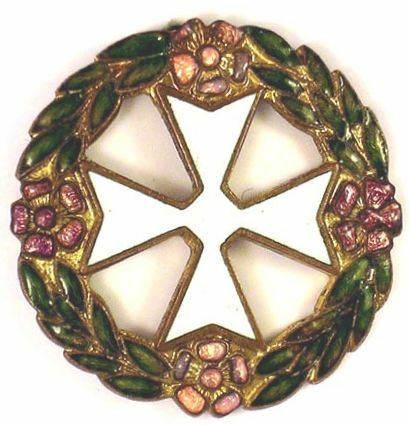 We've included the crest of our colleagues, the 442nd Infantry, in this collection: their 100th Infantry Battalion was assigned to the Division from Salerno through Rome. We then became again a "square division" (four regiments): the 442nd joined with us for the summer of '44 north of Rome, staying until they headed over to Southern France. The Commander's Own Chapter is collocated with the 34th Infantry Division headquarters in Rosemount Minnesota. The Council Bluffs-based chapter is about forty members strong. 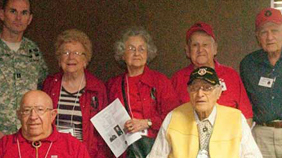 The Des Moines Chapter is headquartered at the Iowa Goldstar Museum at Camp Dodge Joint Maneuver Training Center. The First Minnesota Chapter was formed by Soldiers of the Mankato-based 2-135 Infantry.